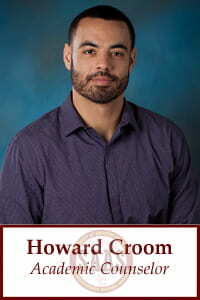 Howard Croom joined the SAAS staff in September 2014 as an Academic Counselor. He coordinates all academic support for the Football (OL, TE, SP) and Women’s Lacrosse teams. He also serves as a chair member of the ACT (Athlete Career Transition) program as well as a member of the Personal Development committee. Howard came to USC from the University of California, Irvine where he was an Academic and Life Skills Coordinator. While at UCI, Howard coordinated all academic support for the Men’s Basketball, Men’s Soccer, Men’s and Women’s Track & Field and Cross Country, Women’s Tennis, and Men’s Golf teams. Additionally, he oversaw and managed all aspects of the NCAA CHAMPS/Life Skills program. Prior to UCI, Howard worked at Oregon State University in the Academics for Student-Athletes department as a Graduate Assistant Academic Counselor for Football. At Oregon State, he also served as the Summer Bridge Program Coordinator. A native of Long Beach, California, Howard was a four-year letter winner at Oregon State in Football. He earned his bachelor’s degree in Sociology in 2010, and his master’s degree in Public Policy in 2012.